Guaranteed to spice up the holidays, our Season’s Greetings Shortbread Collection includes a tasty array of Ginger, Chocolate Spice, Orange Pecan, and Chocolate-Dipped Traditional. Festively packaged and ready-to-give in either a poinsettia or snowflake themed gift box (snowflake not shown). 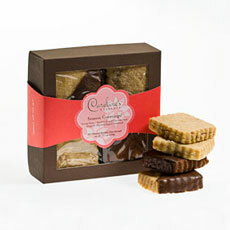 Includes: Chocolate Dipped Traditional, Ginger, Chocolate Spice and Orange Pecan.